In photographing high school football, I really do not have the correct camera and lens to shoot into the night. High school stadiums have lights which are not bright enough for photography without a camera that can handle it. Like a Nikon D3s or D4(s). 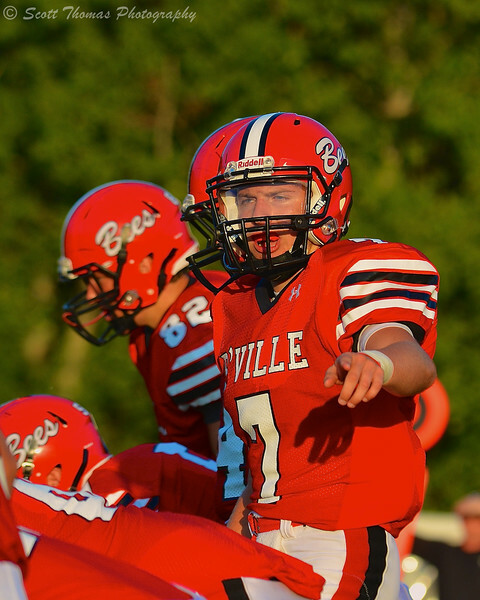 Baldwinsville Bees Quarterback Madison Wolfanger (7) calling a play at the line against the Auburn Maroons at Pelcher-Arcaro Stadium in Baldwinsville, New York on Friday, September 5, 2014. Nikon D7100/70-200VR, 1/1000s, f/5, ISO 200, EV 0, 200mm (400mm 1.3 DX). With kick offs around 6:30pm in my area. I have the last hour before sunset to get my photos which is known as the Magic Hour. Magic or Golden hour gives nice light in the red-yellow spectrum of light as the Sun nears the horizon. 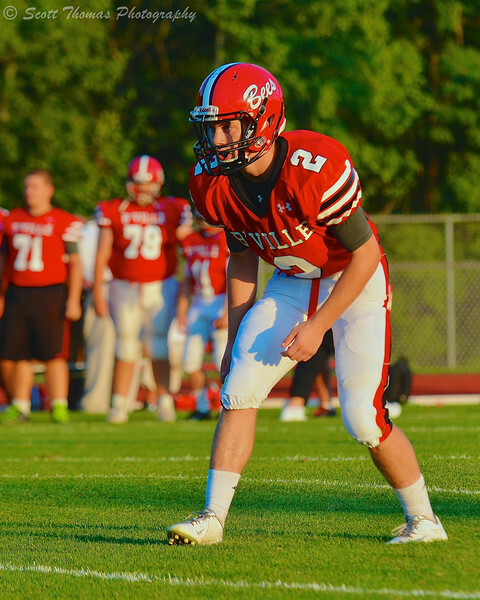 Baldwinsville Bees defensive back Sam Mahar (2) on the field against the Auburn Maroons at Pelcher-Arcaro Stadium in Baldwinsville, New York on Friday, September 5, 2014. Nikon D7100/70-200VR, 1/1000s, f/5, ISO 360, EV 0, 180mm (360mm 1.3 DX). As I was not photographing for any newspaper, I was able to concentrate on getting sport portraits of some of the players. Notice the low angle of the light creating shadows and bright colors. You can tell when I was loosing the light by the increase in the ISO number. 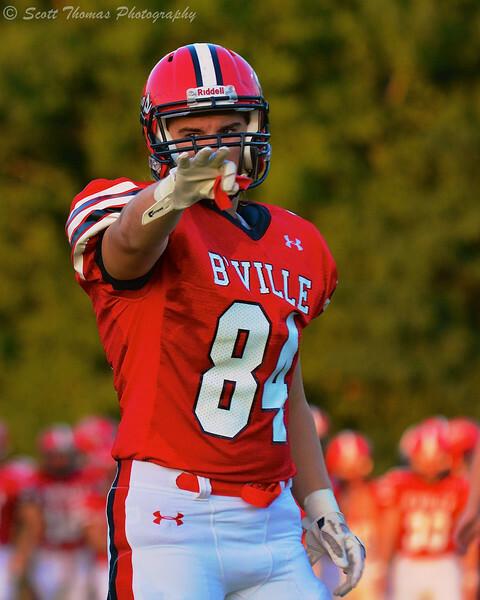 Baldwinsville Bees Josh Greer (84) directing his defense against the Auburn Maroons at Pelcher-Arcaro Stadium in Baldwinsville, New York on Friday, September 5, 2014. Nikon D7100/70-200VR, 1/1000s, f/4, ISO 900, EV 0, 200mm (400mm 1.3 DX). Back in the day (many years ago) I played center and wanted to make sure I got a photo of B’ville’s starter. Baldwinsville Bees Center Anthony Emmi (55) ready to snap the ball against the Auburn Maroons at Pelcher-Arcaro Stadium in Baldwinsville, New York on Friday, September 5, 2014. Nikon D7100/70-200VR, 1/1000s, f/4, ISO 4000, EV 0, 200mm (400mm 1.3 DX). There are many rumors that Nikon will be announcing a new camera this week. I might be in the market. This entry was posted in Sports, Weekly View and tagged 70-200mm, b'ville, baldwinsville, bees, boys, field, football, grass, high school, new york, nikon D7100, pelcher-arcaro, players, portraits, stadium, vr. Bookmark the permalink.